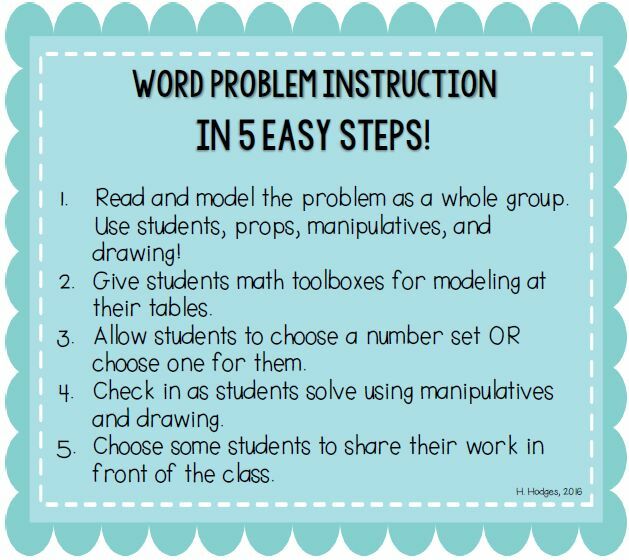 How to SUCCESSFULLY Add Word Problems into Your Math Routine! Incorporating word problems into my kindergarten math routine was a little intimidating at first. 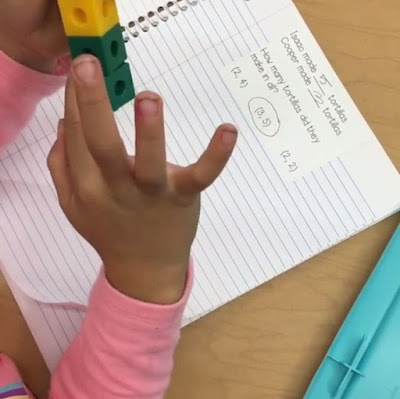 I had tried it so many ways in the past, but it almost always ended up with me in the front of the room, all of my students following along to steps that I told them, all working on the same problem. Even with a part-time aide, I never felt like I was able to differentiate for word problems because there just weren't enough adults to check in with that many different problems! So, I ended up not doing word problems for a long time. Bad, I know! Then I learned about problems with number sets and it changed everything! 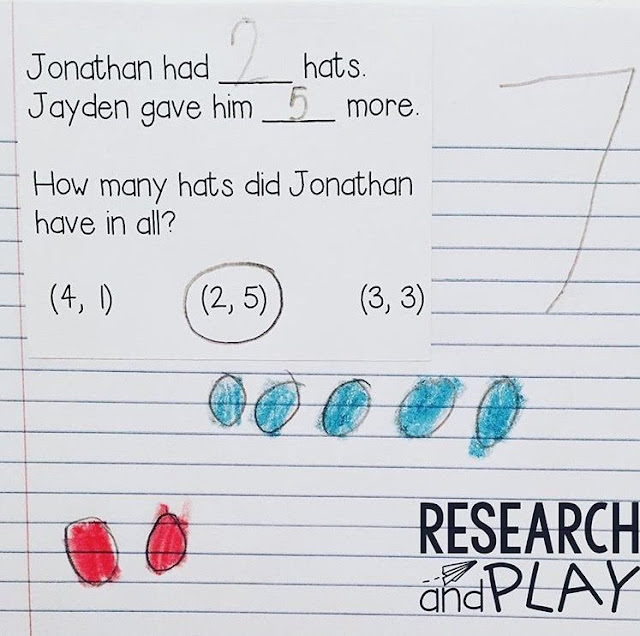 Providing the same problem but differentiating the numbers that the students work with meant that I was finally able to differentiate while also teaching the same skill to everyone. And with some modeling up front, I would finally be able to walk around and check in with MULTIPLE students during word problem time! My aide was able to sit with a few who needed more explicit modeling. While modeling, I choose one of the number sets given. This also helps build confidence of any mathematicians who need to see it modeled more explicitly. I also use one of the math toolboxes that the students will use. 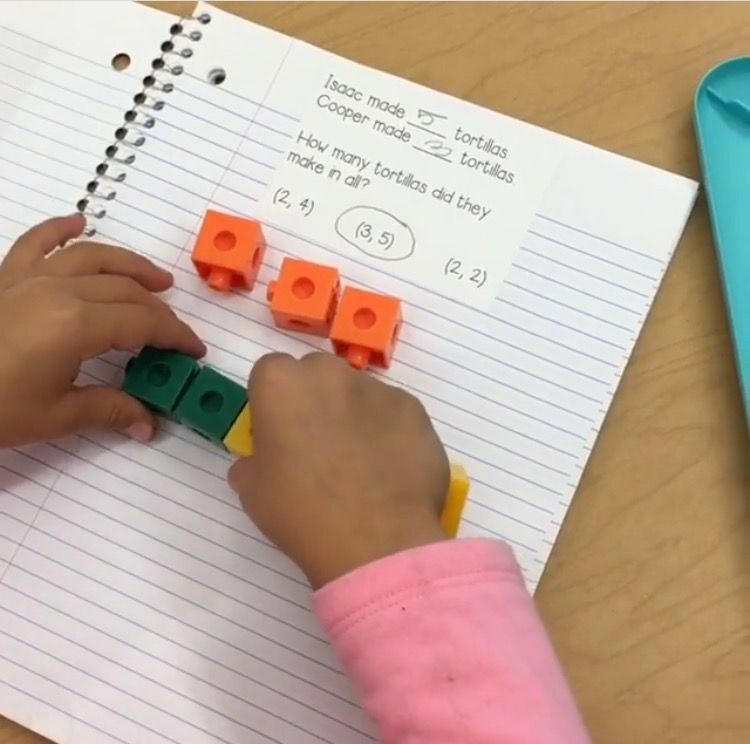 Check out this Instagram post to read more about our math toolboxes! Then I make my way around the room to check in. I like to spend a minute or two at each table to make sure my students are able to work independently. This also allows me to give support or extensions to certain students. She is counting out cubes from her math toolbox in the amount that she chose from her number set. Now that she's solved the word problem with manipulatives, she will draw a picture to match. Once my students finish, they have to be checked by a teacher. I simply walk around, eyeball their work, and put a check in the corner of their notebook. I will choose 2-3 students during this time to go up front and share their work on the big screen. I will either choose 3 students who chose 3 different number sets OR will purposefully choose someone who was making a common mistake. We will walk through the error together. Showing mistakes is one of the most powerful share strategies. As long as you've established a culture where students feel safe making mistakes, it can be very powerful. I hope this has encouraged a few of you to start doing word problems in your kindergarten classrooms. This can of course be used for all grade levels by changing the structure of the problem or the problem type! 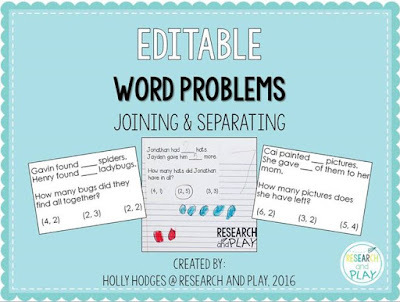 I've created a set of editable word problems for joining and separating, so if you don't want to come up with all of them on your own, check these out! Just change the names and you're done! Comes with instructions for how to print them on labels :) Click the picture below! This looks like a great resource! Do the students at some point write an addition/subtraction sentence to match the picture?